Will you be able to recognize reality from illusion? Are you sure? Feeling haunted by something or someone in your past? Haunted by bad dreams? Release those feelings now or they will follow you forever! Do you have any 'skeletons in your closet'? Perhaps you have unfinished business with someone on the other side? Close your eyes - if your dare . . .
See the spirit in your mind - or confront it in the place it haunts you. or ask for forgiveness for that which troubles you. you will feel better and be able to move on. Looking to ascend into your light body? to fly away and be free? to be One with the Flame of Creation? Let that day be today! Is there a part of your personality that holds you back? robs you of your freedom? makes you see yourself as ugly? Put your finger on your DELETE KEY now and get rid of it forever! Planet Earth may have too many challenges for you at this time! Are you unable to see Spirits? You may be using the wrong eyes. that is just behind them. Trying to create the Perfect Man? Make sure you know what you are asking for? Is someone around you always 'stirring the pot'? Move away from that person or your energies will get depleted! sent back to that person. thus seeing the energies disappear. why do they not affect others? the daily amounts of negativity we all encounter? Could it be that they don't play the drama game? those that would be detrimental to them? where souls are able to function? where no one can hurt you. Is your life going in circles? Do you feel like you are going nowhere? and is really telling you. Although it has changed a great deal over the centuries, the ancient Celtic (Irish, Scottish, Welsh) festival called Samhain is considered by many to be a predecessor of our contemporary Halloween. The Celtic peoples called the time between Samhain (pronounced "SOW-in" in Ireland, SOW-een in Wales, "SAV-en" in Scotland or even "SAM-haine" in non Gaelic speaking countries) and Brigid's Day "the period of little sun." 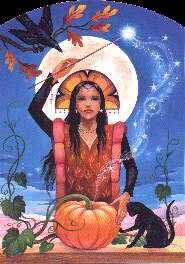 Thus, Samhain is often named the "Last Harvest" or "Summer's End". Samhain was the New Year's Day of the Celts, celebrated on 1 November. It was also a day of the dead, a time when, it was believed, the souls of those who had died during the year were allowed access to the land of the dead. It was a time when spirits were believed to be wandering. The festival also was related to the season: by Samhain, the crops should be harvested and animals brought in from the distant fields. It was both the first day of the new year and the first day of winter. As a point of transition in the annual calendar, a great many beliefs and rituals were associated with the day. The gates that separated the worlds of the living and the dead, of this world and the next, were down and the souls of those who had died during the year were allowed entry to the other world. 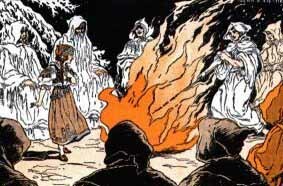 Bonfires were lit on Samhain, some say to light the way for the spirits, others say to keep them away from peoples homes. With the belief in the wandering spirits of the dead came the custom of preparing offerings of special foods, and of dressing as spirits and wild animals. We can only guess at the connections people made between the harvest of crops, the slaughter of animals, and the death of human beings in the cycle of life; or between lighting fires at the onset of winter and the increasing darkness, between mimicking the wandering souls and respecting them, and between the ritualized and stylized offering of food. Samhain was the time of year when the world began to sleep for winter, a celebration of death of some things and the beginning of the long night, or winter. 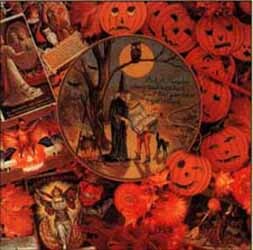 Some believe that there were rituals and traditions to help the living pass through this time of intrusion into their world by the dead, and that many of our modern Halloween traditions have evolved from them. The Celts have been bestowed with the somewhat dubious honor of taking credit for the origin of Halloween. The justness of this assumption remains to be seen. However, since they are said to be the originators of Halloween, it is only fitting that we try to know something about them. This will help us determine if they are in fact the founders of Halloween and if they are, what impact this origin should have on our perception of Halloween. Halloween is the eve of Hallowmas, better know to modern Christians as All Saints' Day. Hallowmas celebrates God's harvesting into heaven the faithful of every age, culture and walk of life. It is a day of glorious rejoicing. Saints are people who, by their joyful service, have extended the love of God to others. The martyrology, the list of the saints officially honored by the church, contains over 10,000 names and those are only the saints we know of. All Saints' Day also remembers those holy people whom no on but God any longer knows. The reading for the day from Revelation describes "a great multitude that no one can count." This abundant harvest of souls is perfectly suited to observance in late autumn. That's why All Saints' Day and Halloween are brightened with corn shocks, pumpkins, apples, nuts and other signs of natural bounty. The American tradition of Halloween ghost-and-goblin madness comes from Celtic lands, where the spirits of the dead were believed to roam the earth for one night before winter began. To ward off their fears of the supernatural, people sat around huge bonfires, telling stories and sharing the fruits of the harvest.